Whenever I mention that I am working on a book about creative late bloomers, someone inevitably says, "Oh, you mean Grandma Moses?" Now I have nothing against that sweet lady. But isn't it interesting -- and a bit irritating -- that so many of the more modern -- and bolder -- examples of creative late bloomers have not received the same attention that Grandma Moses has? It's as if there can only be an exception to the rule of young genius as long as that exception is a sweet old grandmother who paints pretty, completely non-threatening pictures. Yes, Anna Mary Robertson Moses turned to painting when arthritis made it impossible for her to embroider when she was 76. Yes, she continued to paint until her death at age 101. Yes, her paintings have hung in nine museums in the United States, Austria and France. All amazing facts. But she has always been presented as a sort of Sunday painter, a naive or primitive artists, terms used for those who are not to be taken too seriously. Certainly she was never considered to be an equal to her male counterparts in audacity and innovation. She was no Louise Bourgeois. 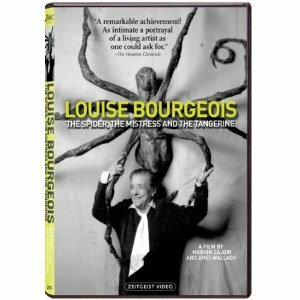 Bourgeois, most known for her giant sculptures of spiders, was a fierce and daring sculptor who also achieved international recognition late in life. She did have some early success, but then was ignored by the art world for decades. It wasn't until her 70th birthday, when the Museum of Modern Art held a retrospective of her work, that she finally gained fame. When she died at age 98, still working in her studio, she was hailed as one of the world's greatest sculptors. Hererra is also a Late-To-Be-Recognized Late Bloomer. Unlike Grandma Moses, Herrera had been painting for years before being discovered. Sixty years. She sold her first artwork when she was 89 years, after almost six decades of persistence! Like Bourgeois, she always followed her own artistic impulses, even if that meant she had to wait for the world to catch up with her genius. She refused to give in to the artistic fads of the day, but continued to paint exquisite abstract work. She is now one of the world's most collectible living artists. "Everybody says Jesse must have orchestrated this from above," Herrera told Sontag. "Yeah, right, Jesse on a cloud...I worked really hard. Maybe it was me." "I am happy that I have been introduced to Carmen Herrera while she is still alive and not after she has passed as too often is the case," writes Niles. "I have fallen in love with her paintings. But I have also been inspired by her story." Hererra, according to a recent interview by Helena de Bertodano in the Telegraph, is not thrilled with her new-found fame. "Really, fame is ridiculous. I didn't used to bother anyone and no one bothered me.Now I am paying because they are paying me." But at 95, she is still painting -- and grateful to be selling her work. "The money is useful because at the end of life, to my amazement, you need a lot of help. Otherwise I would end up in a nursing home. And I dread that," she told de Bertodano. Also grateful are those of us who are looking for more modern and challenging creative late bloomers than Grandma Moses.